Life with Lucie & Ella: Happy 4th of July! 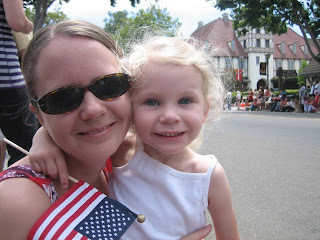 This morning, we headed off to see the 4th of July Parade in downtown Solvang. 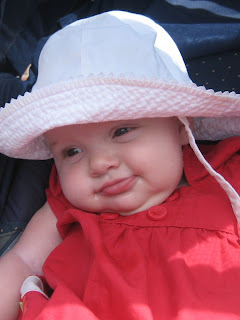 We went to it last year and Ella really enjoyed it. I think it was there that she learned what the American flag is, and since then I've heard shouts of "American Flag!" every time her little eyes spot one. Earlier this week, I told Ella that we'd be going to the parade. Her first response? In a timid voice, "Mom, there aren't going to be any clowns, are there?" I had to be honest and tell her that yes, there probably would be clowns there. But, Daddy told her that he'd protect her. In the picture below, you can see her taking refuge in her daddy's arms from the harmless, yet scary, clowns. 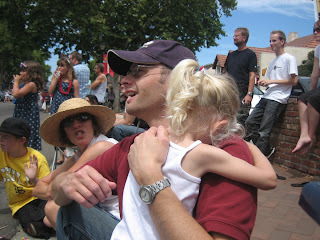 Lucie didn't last very long with the parade. By the time we arrived, she was fading fast and ready for her nap. So, we let Ella sit on the curb -- a much better position to get the candy being thrown -- and let Lucie nap in the stroller. She slept through the entire parade so I guess we'll have to wait until next year for HER to develop a fear of clowns like her sister. Not only is it Independence Day, it is also Lucie's half-Birthday! She is officially six months old today. In celebration, we just may have her try some rice cereal...her first solid food, with the exception of course of the tiny bites of ice cream we fed her on vacation. :) I'm sure all post some pictures of that milestone at a later date. Sounds like you picked up a drawl on your trip! I'm sure all post some pictures of that milestone at a later date. The pics of the kids are great! Thanks for posting. I needed a Piersma Girl fix.